CPE referred to the reference lab have not topped 3k. As I’ve said previously, this is a gross underestimate of CPE prevalence in England. The amount of CPE out there is at least 10x this figure, and probably more than 100x. >98% of Kleb and E. coli BSIs remain phenotypically susceptible to carbapenems, so England remains firmly in the ‘green’ in terms of ECDC heatmaps – but no room for complacency. Not least because the actual number of antibiotic resistant Gram-negative bacteria is increasing notably in proportion to the increase in all GNBSI (see Figure 1 below). Total antibiotic use increased by 6% between 2010 and 2013, but has now reduced by 6% between 2014 and 2017. The main bulk of antibiotic prescribing is in primary care (81%), and there were 13% fewer antibiotic prescriptions dispensed comparing 2017 with 2013. However, in hospitals, antibiotic use continues to rise by 2% (see Figure 2). This represents a slowed rate of increase – antibiotic use in hospitals rose by 12% between 2010 and 2013. But should we be celebrating a reduction in the rate of increase in the use of antibiotics in hospital?? Perhaps – but let’s reserve the full-blown party for when antibiotic use actually declines in hospitals! Related to this, slightly depressingly, only 23% of Trust managed to meet their CQUIN target for reducing total antibiotic consumption, and only 45% managed to meet their CQUIN target for carbapenem consumption. 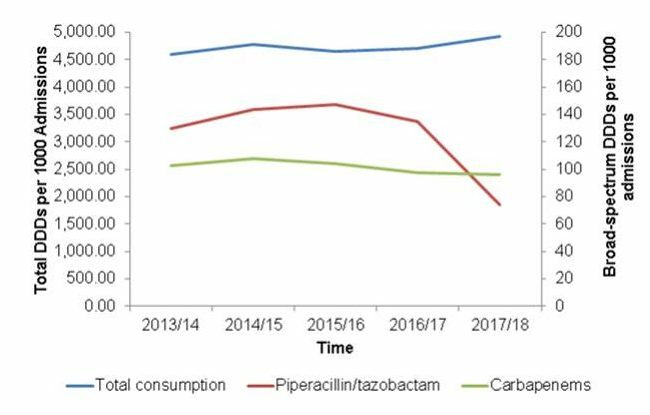 Amazingly, 25% of Trusts managed to fail to meet the CQUIN target for reducing piperacillin/tazobactam consumption, despite the fact that there was almost none of it available. Not sure how they managed that. There’s a section summarising the largely successful interventions to control the spread of Candida auris in England hospitals. Some interesting modelling work suggests that 17% of antibiotic therapy days in secondary care are unnecessary. The TARGET antibiotic tools and resources are proving popular and useful. We’re lucky to have this report – thanks to all who have put it together.